Shaun Nestor, Jennifer Ljutich, Kyla Mansfield and Kerry Lindemann in the studio at WRPI, the campus radio station at Rensselaer Polytechnic Institute in Troy. 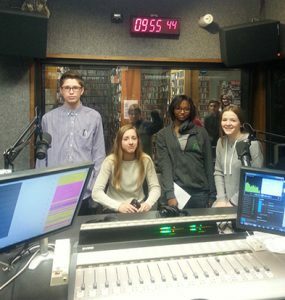 Freshmen recently went live on the air and played DJs for a day in presenting podcasts at WRPI, the campus radio station at Rensselaer Polytechnic Institute in Troy. The bioengineering class recorded podcasts to describe a cool cutting-edge genetic technology for a project about DNA. They learned about DNA and how it works, how this knowledge is applied to cutting edge technologies and how to create a podcast. Four teams were selected to present their podcasts. They briefly introduced the podcast live and then they were played on the radio. Kerry Lindemann, Jennifer Ljutich, Shaun Nestor and Kyla Mansfield. Isaiah Jamison, Blaine Walker, Patrick Logsdon and Jennifer Keller. Montana Higgins, Emine Turkoglu, Skyler Moon and William Lester. Jack Ganger-Spivak, Ian Jensen, Mylea Braun and Ryker Dorman. “The students enjoyed seeing a radio station and all of the music and technology used there,” teacher Diana Weldon said.